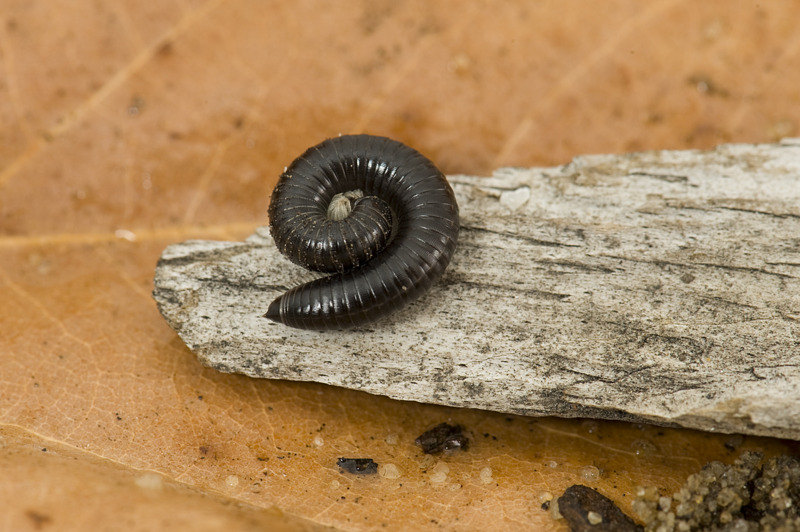 Although millipedes play a useful role in breaking down organic matter in the soil, Portuguese millipedes are pests when they reach high population levels. Portuguese millipedes are not harmful to animals or humans, but they can be a significant domestic nuisance when they invade homes and gardens in their thousands each autumn and spring. They are one of the few millipede species that are attracted to lights at night, and this is presumably why they invade homes. They do not breed inside houses, and once inside a house will probably die. Millipedes can occasionally damage horticultural crops such as melons, strawberries, tomatoes and potatoes, yet in small numbers they do no harm. No damage to broadacre crops has been reported. Portuguese millipedes are attracted to lights. Turn off external lights which are close to buildings and minimise the escape of light from buildings through use of curtains, blinds and weather-strips on doors. Effective door seals will prevent the entry of these unwanted pests. Millipedes in the house and garden will probably have resulted from eggs laid within 100m from the house, and while compost is good for gardens, it also allows higher populations of millipedes to develop. Reducing the area covered by organic matter such as compost, leaf litter and mulch, will help reduce millipede populations by diminishing food and areas of shelter. Some spiders, beetles and scorpions will eat millipedes, but these predators do not significantly reduce millipede numbers. They are also parasitised by a nematode and a European fly. Work was under way to establish this fly in South Australia, but the flies were released and never seen again. In 1988 the parasitic nematode, Rhabditis necromena, was released by the Department of Agriculture South Australia in more than 2000 locations in that state. The pest status of the Portuguese millipede has decreased in many areas in South Australia since that time. Rhabditis has been found in millipede populations from the Perth area, and this seems to have provided relief in some areas but will not provide total control. These nematodes attack only millipedes and are active during late autumn and winter. Nematodes may take several years after introduction to reduce millipede numbers, especially in areas adjoining bushland which can support enormous populations of the pest. Smooth barriers can stop millipedes from entering houses because they cannot cross smooth, vertical or rounded surfaces. These can be fixed to walls, below doorsteps, window ledges and vent bricks but must be kept clean and free of bridging vegetation. These barriers must be continuous with no breaks, unless placed under doorways. Plate glass, 7.5cm wide and 4.5mm thick, can be set around the base of the house. This prevents millipedes from entering because they cannot gain a foothold on the smooth surface. A moat and trap system can also be installed around dwellings. A 100mm C–Purlin with return lip, buried flush with the surface of the ground may be used for this. Millipedes fall into the moat (wet or dry), and cannot escape the overhanging sides. The ends of the channel may also be modified to include a trap, but this is not necessary as the millipedes will die in the moat if it is clean and free of debris for them to feed on or dwell in. A less permanent barrier is formed using a wide smooth vinyl, polypropylene or polythene tape of at least 48mm. Teflon-coated tape can also be purchased. Fix the tape to the wall with contact adhesive. Light-traps have offered good control. You can purchase light traps, some with solar powered lights, from your retailer or online. Alternatively you may choose to construct your own light trap using a trap box with smooth sides, buried flush with the surface of the ground and using low voltage garden lights or a weather-proof fluorescent light to attract the millipedes at night. If the trap box sides are smooth and at least 100mm high, the millipedes will fall into the box and not be able to escape. Light traps can be set up along the outside wall near where the millipedes are entering, or in the garden to lure them away from the house. Residual chemical barriers at least one metre wide present millipedes with a treated surface wide enough to kill them before they enter a house. Many pesticides have a limited active life and must be re-applied for ongoing control — especially during periods of rain. Chemicals can be applied to outside walls, paths and garden beds or other areas where millipedes are thought to breed. Chemicals must be used in accordance with instructions on the label.